You know the drill. It's time to d-d-d-duel! This time you're a part of the Shadow Games in a way you've never been before, thanks to Micorsoft's HoloLens. 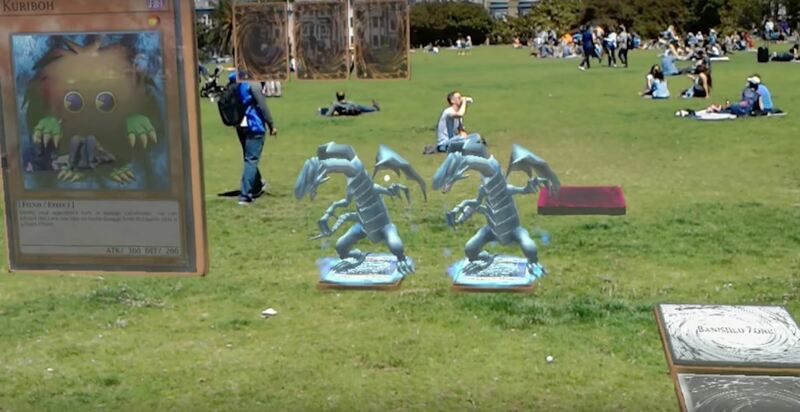 YouTube user MicrowaveSam posted a taste of what fans will one day be getting in terms of an augmented reality Yu-Gi-Oh game for the HoloLens. The game is called "Yugioh AR" and although it is described as a fan-made video for a fan-made game, MicrowaveSam does say that there will be an official release of this game coming soon. The creators headed to Dolores Park in San Francisco where they were able to test their game. The video starts off with one user putting on the HoloLens and a screen appearing asking them what card action they'd like to make. Like in the card game, users can choose a multitude of different moves including summoning creatures, activating spells and traps, making moves with their deck of cards, and more. The friends then stand across form each other with a huge virtual stack of Yu-Gi-Oh cards on each side. Each person also has a number of life points projected above their heads, starting off at 4000. Then the duel begins with each friend drawing five cards from their respective decks by using their hand to tap the cards. The cards selected appear in front of the user for him to wield as he wants. Once one user wields a card, an AR monster will appear for both users to see. Either user can tap on the monster to get more stats on it in order to make an educated decision on how to retaliate. What's cooler is that within the game, all card actions can be voice controlled. Meaning, users can select a monster with their hand and then say "Normal Summon" and the card will follow that action. The graphics are pretty amazing too. Each monster looks exactly like it would on the show/card game and the quality is almost Pokémon GO level. Each monster also has their own animation for when they attack, complete with noises. The only thing about this game that could possibly be a little annoying is that you still have to manage your own life points, using a calculator that you have to manually input information into. Since it's still in development, we have no idea if these features are going to improve even more by the time of the official release. There have been talks of AR Yu-Gi-Oh games in the past, but with an official release teased as coming soon, it's possible that MicrowaveSam's version could be the next Pokémon GO. How To: Build a stronger deck for playing Yu-Gi-Oh! How To: Make and paint a custom mat for playing Yu-Gi-Oh! How To: Draw the manga character Yu-Gi-Oh!